I started throwing in 2011 after finding Knife Club online. I’ll never forget my first visit to Pontefract: coming away with an aching arm and a grin from ear to ear. The next day I made two flat bar knifes and put up some targets. Soon after I had friends wanting to learn, so a few targets soon turned into a range! 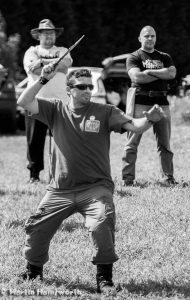 In 2011 I attended my first competition at Knife Club and won long distance hawk – earning me my throwing name, “Dan the Man”! I’m very proud to have set up the 2nd official KATTA range in the UK at Woodend Target Sports. And I soon passed John’s KATTA Instructor Course. 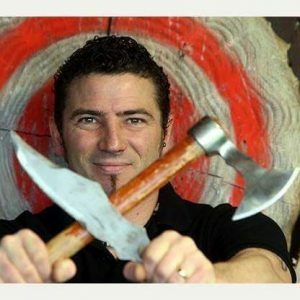 In 2012 I also became a Master knife throwing instructor, under the IKTHOF. I have traveled to Europe to take part in Eurothrower’s tournaments and in 2015, with John and Richard, ran the Eurothrowers World Championships at Woodend. We have just run the first ever official UK National Championships 2017. From the first flat bar knives I made in 2011, I have made many more since – moving onto setting up my own blacksmithing forge. 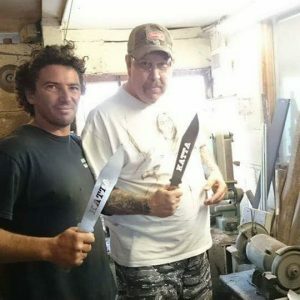 In 2015, master knife maker Joe Darrah came to our World Championship throw and I was lucky enough to spend time with him in my workshop working on KATTA knives. Use this Amazon link and you will help with our website costs!